AVIVA Rental Systems, is an authorized dealer for Milos Structural Systems. Milos products are suitable for temporary or permanent use, indoor or outdoor, and offer fast and simple assembly without sacrificing strength and stability. And with flexible transport services that encompass air, land, and sea, a floor or roof truss of any size and length can be speedily delivered at an affordable price. Milos Structural Systems makes for stress-free set-up and breakdown for concerts, tradeshows and other events. Even veteran members of your crew will appreciate the ease of assembly and the confidence of solid truss design and construction. 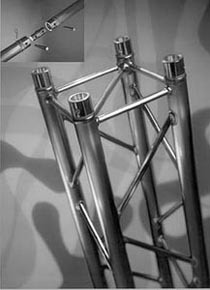 All QuickTruss systems feature solid conical connectors and tapered pins for an extremely quick, simple and secure assembly of structures. A wide variety of standard junctions and accessories are available for all our aluminium truss ranges. Custom lengths, junctions and curved sections can easily be produced to suit specific requirements and more unusual trussing and exhibit design needs. All truss ends are fitted with precision CNC machined receivers and braced with horizontal end spars to provide durable construction, making them perfect for continuous use in harsh environments. However, stability doesn't equal complexity. It is simple to assemble a temporary structure for a short-term event, making QuickTruss the smart choice for an exhibit truss design or lighting truss system. Milos' xStage modular stage systems are designed for any environment and application, from simple risers for small performances to complex stage constructions for large outdoor events. Whether you are a small school performance group or a world-famous band performing sold-out concerts, xStage is the perfect choice for temporary event staging. Light-weight decks manufactured using custom extruded aluminium space frames, xStages are built for maximum strength and rigidity (up to 750 Kg/m²). The low-profile construction produces low dimensional volume, which makes storage and transportation logistics much easier. Platform sections are joined together using an allen key and special xStage QuickConnectors in order to provide an extremely fast, simple and secure assembly. These features make xStages perfect staging for a touring show or any other type of exhibit where the staging needs to be moved or assembled and disassembled frequently. Not sure you're ready to purchase? Click to check out AVIVA Rental Systems' AV rental site!